Deep Canyon Ranch. A place with an intricate history. A place where love grows in abundance and family is at the center of the focus. A place where people come and experience true beauty and peace in the deepest parts of their being. A place that I have come to call home for this summer season. This family-run ranch is nestled in at the base of the Teton Pass, surrounded by peaks that are currently painted with white snow obscuring the boundary of where the mountain ends and the cloudy sky begins. The May weather seems to be holding nothing back in its desperate attempt to slow the preseason preparation for when the ranch will be bustling with guests. Little does the wind know that the cozy lodge, currently being warmed by a wood burning fire, is just as peaceful inside watching the trees dance in the wind and peaks being frosted with snow. A cup of coffee, the smell of lunch wafting its way from the kitchen, and a beautiful view out the front window by the fire is enough to bring any soul to rest. One must simply look past the little red, purple and yellow flowers dancing on the front porch as they courageously brave the wintery spring weather to see a view fit for a king. Surely if these tiny, well-dressed buds can survive winter’s final attempts to keep summer from coming, we can as well. The guest season will be taking off in a couple weeks and with it, excitement and energy will be surging through the ranch. For now, the new staff is getting acquainted with the ins and outs of the ranch’s operations and gearing up for the full list of activities that will soon commence. The cabins are being prepped and the horses shod. The off-season stiffness is being worked out of the wood and life is returning to the grass and greens surrounding the ranch. The finches have returned to their arguing over which rung belongs to whom in the feeder and the hummingbirds have returned to their sweet little dancing around the sugar water. Even the pair of ravens have begun their routine of stealing leftover bread tossed in to the lawn and hiding it away in a neighboring pasture. These birds are another confirmation that the summer sun is not far. Yes, there are glints of summer amidst these snowy flurries and angry wind. This preseason muck has allowed for something very special, however. 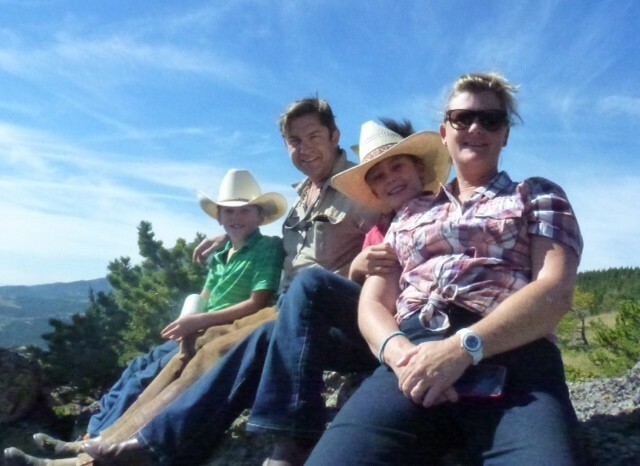 It has allowed for quality time spent with the owners of this beautiful ranch and their incredible family. Chuck and Sharon Blixrud are two of the kindest most genuine folks I have ever come in contact with. Chuck has a presence of serenity and steadfastness unlike any man I have met. He has a quiet strength that is undeniable, and he truly and deeply cares about each person he meets. Chuck has worked incredibly hard his whole life and is without a doubt, the backbone to this ranch. It is impossible, however, to mention Chuck without his beautiful bride, Sharon. She is in every way his partner and other half. Sharon’s smile lights up the room in the instant she enters it. Her nurturing and giving soul is surely what has kept this ranch in business for all these years. I have truly never met two souls as special as they are. The experience at Deep Canyon Ranch would be more than worth it to simply have the honor of getting to know such beautiful people. So to the snow that has in the time since beginning this blog become a curtain of white, hiding the tall mountain peaks out the window, I say, “do your worst!” It may be the last opportunity you have to send your coverings until after the guests have all returned to their homes at the end of the season. And I would even thank you for your moisture and cold temperatures, for it has given me the opportunity to soak in the fellowship from the people that call this place home, and to admire the scenery from a fire lit lodge. And to you who are reading this, if you have never had the opportunity to experience Deep Canyon Ranch, I would say to you that you are truly missing out on an experience you will hold with you forever. The views, the riding, the food, the activities, and most of all, the people are all things you will never forget. There are many things I have learned in the two weeks I have been here in Montana. Some things have been really hard and some have been really wonderful. I came into this Northern adventure knowing that God must have some big things in store for me, as there was no other explanation for the longing I felt in my soul to be here in Montana, and specifically at Deep Canyon Ranch. The first and most difficult thing I am learning is this: Some things just take time. There is a girl here, Baylee. She is my counterpart wrangler and we could not be any more different. Her spirit is one of complete abandon. Her long, beautifully colored red, purple and blue hair flies behind her as she fearlessly jumps on any steed. At any moment she has any array of stones around her neck or in her pocket. Her pokemon tattoo so affectionately peeks out when she feels so inclined to share it. She is a self proclaimed mermaid cowgirl and unabashedly shares her love for princesses and anything outside of mainstream normalcy. She is truly a beautiful person. Our friendship is the most unlikely of friendships, and yet it works so well. She is the resident horse whisperer and she has appointed me as her apprentice. Baylee has a way with horses I have never seen. She seems to feel what they feel and know what they think. She is such a deep feeler in every way. There is so much depth to this brilliantly colored woman and she seems to share in the soul of a horse. And while she thinks she has just taught me about horse training, really she has taught me a lot about life and, unknowingly, the character of God. We were talking the other day after she worked with Ruger, a young and nervous horse that we have been riding. She was telling of how its a delicate balance when training a horse and giving them confidence in themselves and trust in you. That we can’t expect a horse to go from step 1 to 100 in a day or even a week. There are stages and small, tiny victories that we must celebrate along the way. If a horse makes a small step forward, that is enough to let them celebrate, and it is important to end each day on a positive note with them. It takes time for them to grow and while all the hard work of training will eventually bring about a reliable horse, there is long growth stage. Ranch Vacations – Trend for 2016! Ranch vacations, the travel trend of 2016! Ranch vacations are ‘The Vacation That Has It All’ basically! Ranch vacations should not be overlooked as being only suitable for wannabe cowboys and horse-riders. No sireeee! This couldn’t be further from the reality. Of course they’re ideal for people requiring their Wild West or equestrian fix, but we at Top50 Ranches have the insider knowledge to share with you, that they are so much more! Interested to see how they might fit you and your fellow travellers…? Read on! Many of the top ranches round the world are specifically geared towards accommodating everyone in the family, regardless of age; Red Horse Mountain Ranch and Lone Mountain Ranch have both won prestigious Awards of Excellence for creating havens for multi-generational families – granny can kick back while you go wine tasting and the kids learn to kayak! And according to reviews by guests on Trip Advisor, the best ranch for those of you with younger children isAlisal Ranch. We all know those teens can be hard to impress so the award-winning Elk Mountain Ranch is the answer, as they were voted the ranch with ‘Best All-Round Activities For The Entire Family’ in the 2015 Ranch Awards of Excellence. Want a truly wholesome, robust ranch experience? Deep Canyon Guest Ranch celebrates time-honored traditions while, according to Trip Advisor, Lazy L&B Ranch gives visitors the feeling of being a truly family-friendly holiday spot. The famous Ranch at Rock Creek guarantees quality all round, from the food to the activities, riding and accommodation. Posted in Deep Canyon Ranch News | Comments Off on Ranch Vacations – Trend for 2016! 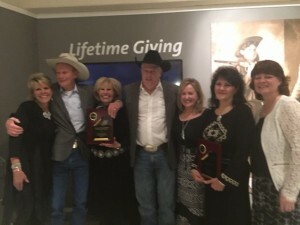 We just returned from the 90th Anniversary of the Dude Ranchers’ Association, where we were honored to be inducted into the Dude Ranchers’ Association Hall of Fame. Mom and dad joke that if you stick around long enough that’s what happens. All joking aside, it is much more than that. When they started their operation back in 1959, they had no idea what they were in for. Years would be lean, and years would be fat. Through it all they knew they had someone watching over them. They have provided a beautiful ministry in their part of the Rocky Mountain Front, that guests are drawn to. You need a passion for what you do, and their’s shows in every guest that arrives at our ranch. I am extremely proud of the ranch that my parents have created, and am honored to continue following in their footsteps, sharing the same desires and passions. 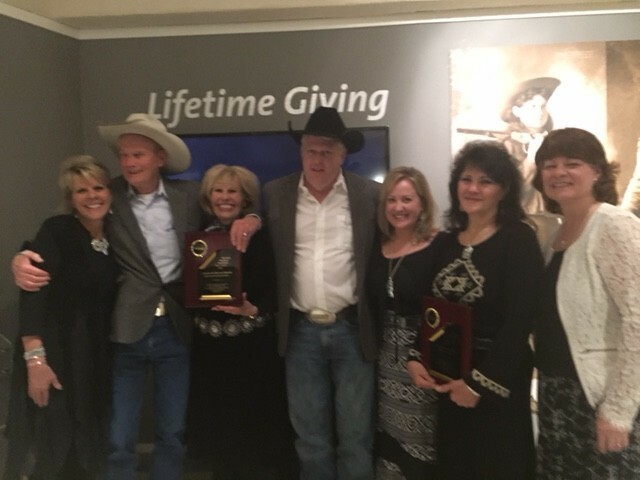 We were also joined by two other ranches, with the same historic legacy – Max and Ann Barker of the JJJ Guest Ranch were honored. Their son and daughter-in-law, Ernie and Kim, accepted the award on Ann’s behalf. Max went to be with the Lord a few years ago. Also, C.B. and Helen Rich of the Rich Ranch. Their award was accepted by daughter Peggy and daughter-in-law Belinda, who own the ranch now with their families. While we all offer a little different vacation – the goal is the same. To share with folks from around the world a lifestyle that promotes horses, hats, hospitality, heritage, honesty and heart! So go in your closet, dust off your hat and boots and book a trip to Montana! Our Guests Say It Best – Ridiculous!! 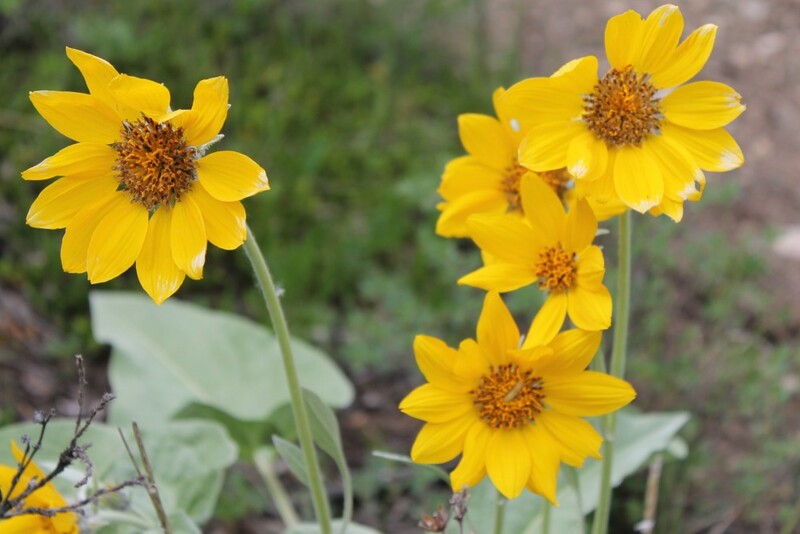 Posted in Deep Canyon Ranch News | Comments Off on Our Guests Say It Best – Ridiculous!! Here at Deep Canyon the words “change of season” have a couple different meanings. The most obvious change is the daily and nightly temperatures that prompt the change in foliage color here in the canyon. We were fortunate this fall to keep our golden leaves a little longer. September and October were beautiful months for horseback riding and we enjoyed the warm indian summer days. The winter winds and snow are on their way, and with a good supply of firewood, a stack of books to read, and anxious emails to answer from folks wanting to visit the ranch next summer, I am ready to settle in for a few months. The other change of season is the transition from guest season to winter. While we love the guest season, and the friendships we make, I have to admit that I look forward to enjoying my own home for a few months. Catching up with some much needed “lap” and hiking time with my dogs, cooking for only 2 and sleeping in. People ask what we do all winter. I simply tell them that somebody needs to watch the snow fall! I always look forward to the change of seasons. I love our seasons in Montana and at Deep Canyon Guest Ranch! After spending some time at Deep Canyon Guest Ranch west of Choteau, Montana I sat down and thought about the visit. The one thing that kept popping in my mind was that I seemed totally relaxed. I realize that happens on many vacations because we don’t have to be thinking ahead to schedules, grocery lists, laundry etc. First of all I became aware of the lack of noise or, what Chuck Blixrud at Deep Canyon refers to as the sound of silence. One time when I was visiting with Chuck he said “did you hear that?” I mentally chastised myself for missing something and said “what?. Chuck replied – the sound of silence! That silence is a beautiful thing and I’m reminded of it as I hear construction trucks outside my window working on the street by my office as I write this blog post. The meals at Deep Canyon Guest Ranch are served family style so you get to know the other guests and you learn to take time and actually visit! One evening I noticed a group gathered before the evening meal in the comfy lodge while some were out on the deck. I don’t even want to start thinking about the actual food served at the ranch because I’ll get hungry. Their homemade rolls were delicious! The pace is a little slower at the ranch and we took some time to sit outside, enjoy the mountain air and have a refreshing beverage. There is a wreath on the front deck of the main lodge at Deep Canyon that says “Come sit on our porch”. That’s a mighty welcoming message and I can close my eyes and imagine myself right back in that comfy chair, looking out at the peaks of the beautiful and rugged Rocky Mountains. So, what do people really do at a guest ranch? I found out not everyone rides horses (I just figured that’s why you would go to a ranch). The Teton River runs right by the ranch and fishing is a favorite activity among some guests. You could also hike in just about every direction. Some guests just enjoy the serenity of reading a good book while sitting outside and occasionally looking at that gorgeous scenery. And some enjoy a bit of pampering by the attentive ranch staff. After the evening meal at the ranch several of us wandered over to the corrals where the horses were. They are turned out each night to graze and roam freely. Several of the horses have bells on them and, in the morning, the wranglers ride up the mountain to find them. The sound of the bells can give the wranglers a good idea where the horses are. Getting to Deep Canyon is easy. It’s about 23 miles west of US Hwy 89 that runs right through the town of Choteau. The road to the ranch is paved for most of the way. Just the last few miles are gravel. I’d like to go back to Deep Canyon Guest Ranch and take my kids and grandkids. One evening there was a multi-generation family at my dining table and I sensed that everyone was making lifelong memories. My family might not all do the same activities each day but we’d share our guest ranch experiences over home-cooked food at the dining room table each night. Family memories.They are worth a lot. As is normal for spring along the Front, the winds are blowing, but there is a hint of warmer temperatures. As I walked my favorite 4-legged friends this afternoon I enjoyed the warmer air and the smells that bring the promise of spring. I scoured the trail for sign of the first flowers and found their purple beauty hiding under the jack pines. This begins the promise of a garden of wildflowers that will soon cover the meadows and hillsides. We will welcome their arrival like an old friend returning to us for a visit. The day was dawning bright and clear as I walked down to the corral at Deep Canyon Guest Ranch for the morning wrangle. Dylan was already up and had the wrangle horses caught and was busy saddling when I arrived. As we headed up Pamburn Creek in the Teton Canyon, conversation was light at 5:30 in the morning and we were both still thinking about what the world looks like that time of the day, and where we just might find the horses. Pamburn Creek is such that the best grass lies at the far end of the pasture and we’ll normally have over a mile ride before we hope to hear their bells. The trail takes us near a Goshawk’s nest where there are the young ones still hanging out. It’s early July and time they were fledging. But this morning we hear the squawking and are put on guard. Sure enough, here she comes, dive bombing us and putting our horses on edge. One dive and she returns to her young. We found the horses grazing peacefully in the bowl beyond the wind gap and made it back in time to have breakfast with the guests at the ranch. Say Chuck, what do you think about packing a lunch today and heading up Chicken Coulee says Dylan, and take the folks horseback riding to show them that trail that follows along towards Blind Horse. We can ride over to that nice basin and have lunch by the waterfall and slip the bridles and let the horses graze right along with us. It was about a five mile ride, taking us up Pamburn Creek, dropping into Chicken Coulee, then along the bench of scattered fir and open grassland near Blind Horse Creek. A mule deer doe jumped up, startled by our passing but didn’t go far before stopping, so we knew she had a fawn hiding nearby. An unusually clear day, quite common here along the “Rocky Mountain Front” of Montana, we point out the Sweetgrass Hills as they straddled the US, Canadian border almost 100 miles to the north, and the Highwood Mountains another 100 miles to the east. Upon arriving at the waterfall we dismounted and dug into our saddlebags to see what Deb and Sharon had packed in our lunch bag. The guests were stretching their legs and remarking on the scenery. I had to smile as I thought back about the lady last year who had come out from Michigan with some friends. She had used up all the adjectives she could think of describing the beauty of the land, so all she could think of was; this is just “Ridiculous”. After a fine lunch made up of a tasty sandwich, cookies, candy bar and an apple, we had a short snooze, caught up our horses and headed back to Deep Canyon Guest Ranch, our Dude Ranch haven in the Teton Canyon. Another fine day, good country, good horses, good company.